Bluetongue Premium Lager is celebrating the official opening of its new Bluetongue Brewery at Warnervale on the NSW Central Coast by giving two lucky beer lovers the chance to brew their very own batch of Bluetongue with three of their mates. Late July saw Jennifer Hawkins tasting the very first bottle to come off the packaging line at the Bluetongue Brewery, and is looking forward to sharing the freshest beer possible with Australians in the lead up to this Summer through the “Taste to Win” competition. Pieta Jordan, Bluetongue Marketing Manager said, “The new Bluetongue Brewery has been engineered for taste and quality, which results in that brewery-fresh great taste. 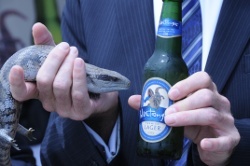 Bluetongue beer lovers understand that the best tasting beer is always the freshest beer. It became obvious to us that we should give our consumers the chance to see and experience the level of sophistication and care we put into every brew of Bluetongue – and provide them with the opportunity to taste beer as the brewers do; fresh from the tank. Every brew of Bluetongue is brewed with three different types of hops to deliver that perfect balance of flavour, aroma and finish so I have no doubt that they will jump at the chance to come to the brewery and brew their very own signature Bluetongue”. The Bluetongue “Taste to Win” promotion will be running between October to December in bottle shops nationally along with supporting promotions at selected licences premises. 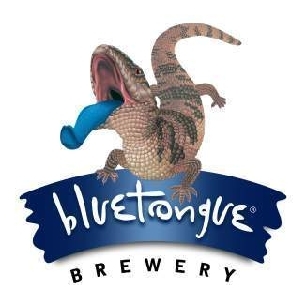 The competition will give two Bluetongue winners and three of their mates the opportunity to visit the new Bluetongue Brewery at Warnervale and brew their very own batch of Bluetongue which will be bottled with a personalised label. For a chance to win the Ultimate Brewing Experience Bluetongue drinkers need only purchase a 6pk or case (for 4 chances to enter) of Bluetongue Premium Lager and SMS or go online to www.bluetongue.com.au/tastetowin to enter their unique code found inside each 6-pack to enter the draw. Last Thursday saw the Hunter Valley local celebrities Jennifer Hawkins & John Singleton toasting the first batch of Bluetongue premium lager to come off the production line at the new $120 million dollar Warnervale brewery on the New South Wales, Central Coast. The brewery owned by Pacific Beverages which in the four years since its inception has already managed to corner a 10% share of the Australian premium beer market. The new brewery at Warnervale currently boasts an annual production capacity of 50 million litres (6.5 million cases of beer). But a big focus of its design has been modularity meaning it can grow with time to produce around 150 million litres over time. 7am this morning marked a momentous occasion for the beer industry in Australia, with brewing commencing at the brand new 120 million dollar Bluetongue Brewery at Warnervale. The brewery has taken 18 months to reach operational status and boasts world class technology enabling the Bluetongue brewery to brew a wide variety of beer styles. Bluetongue’s Brewmaster, Dermot O’Donnell says, “Starting up the brewery was such an exciting moment for the brewing team today. The 2 years of intense planning, hard work and around the clock commitment from the team seem to have paid dividends and we have had a successful start to the brewing process. O’Donnell explains, “The Bluetongue Brewery is unique in its design because it has twin-stream brew houses – a large and a small one under one roof, which allow for brewing flexibility to suit consumer and customer demand.